There are moments in my life in which I wish I was still considered an “at risk youth” or just “youth” for that matter. Back when I was in school, I wasn’t introduced to any kind of after school programs, internships, opportunities or anything extra curricular like that, that would help me do better in school and go straight to college or a profession. The closest I got was D.A.R.E. Is that program still in schools ? Any who, I’m passing on some information that will hopefully reach the intended audience. Please forward this to any teachers, teachers aid, principals, students, parents or siblings who would know someone who would want to be a part of this on going project here in Boyle Heights. It’s safe to say that I’ll be there of course since there will be free food. But that’s beside the point, which is to save the youth from whatever social problems and ills that are affecting our communities by giving them the opportunities some of us never had. To mentor them and all that jazz, cause you know, kids are the future. ¡Tu Opinión Cuenta! Let Us Hear Your Voice! Do you want to give a voice to your community? Learn how to tell stories that make a difference? 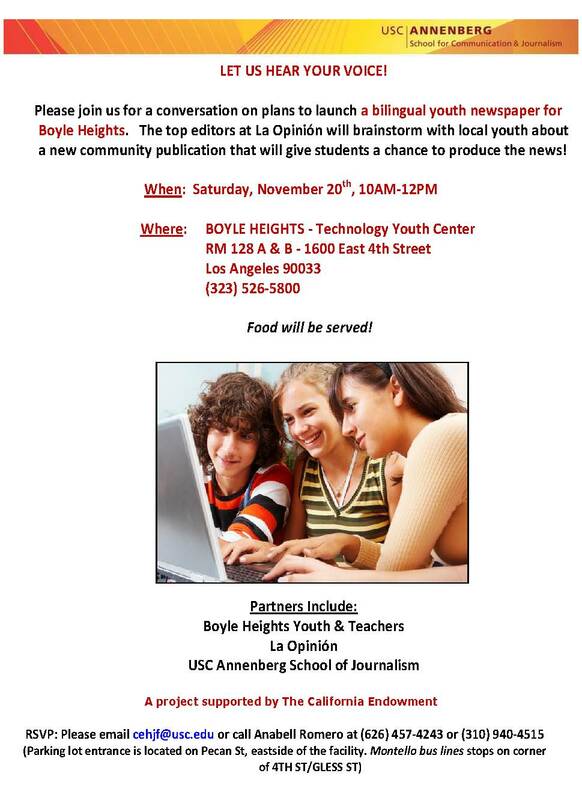 If so — and if you are a Boyle Heights high school student — please join us on Saturday, Nov. 20, to help us plan for a new bilingual newspaper in Boyle Heights — produced by youth. We are holding this meeting to hear what students would like to see in such a publication and to let them know our plans. Students will guide us in this project, telling us what topics they think are of greatest interest in the community, what they want to call the publication and more. We will help them come up with ways to do their best work! USC’s School of Journalism, in partnership with top editors at La Opinión will be collaborating on this project and working with students one-on-one after school. We would like to encourage students with a creative spark and an interest in improving their community. Students who participate don’t have to be “A” students or fluent writers in Spanish. They just need to want to make a difference. The heart of the project will be a print publication, published and distributed by La Opinión for the community of Boyle Heights. Student journalists will have a chance to produce video and audio. Interested bike riders in Lincoln Heights, El Sereno, or Boyle Heights? This entry was posted in Blogs, boyle heights, Eastside, Events, Food, Gente, Identity, La Crisis, Media by El Random Hero. Bookmark the permalink. This looks like a great event! I’m always down with getting the youth involved and writing. Hey Random – cool post! On a side note, I wonder if we could be considered “At Risk Adult? Why don’t we have an At Risk Adult label? We have At Risk Youth, right? Bueno pues, I’m pretty sure we no longer have D.A.R.E. but those hip, distressed vintage shirts can still be purchased at your local hip used clothing store for $30. I’m curious to see how much of a collaboration this is going to be (if it is one, at all.) Will the work see the light of day in La Opinion? I’m also interested in finding out the distribution model. I really hope it’s not a print publication (although that’s what it sounds like.) I hope the kids get a chance to play on WordPress and are able to tell their stories online. I’ve always been an at risk adult HA !